Now comes the culmination of all our efforts so far! Sowing seeds is probably the most critical part of growing trees – get it wrong now and up to two years of work and patience can be wasted. Get it right, however, and we will be rewarded with a new generation of trees for replanting into our landscape. During late-winter or early-spring carefully check your seeds for signs of germination. The ideal time to sow any seed is when the root is just beginning to emerge. Why do we wait for signs of germination? Well, because of the dormancy that exists in most tree seeds, it is important for us to be sure that we have overcome this and that the seed is ready to grow. The only way to do this for sure (without any sophisticated laboratory equipment) is to wait for germination. If seeds show no signs of germination after the recommended period of pre-treatment, we can leave them for another year rather than wasting valuable space or compost. If you are growing only a small number of trees in containers, then you can sow only those seeds that have begun to germinate. In seedbeds, we should wait until at least 10% of our seeds have germinated before sowing. The correct size of container to use will depend on the species of tree you are growing and on how long you intend it to remain in the container. As a general guide, the faster-growing trees (alder, birch, hawthorn and so on) should only need to spend one year in a 1- or 2-litre pot. 1-litre milk cartons have proved successful as long as we make adequate drainage holes in the bottom. 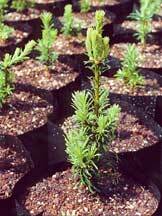 Slower-growing species (the oaks for example) may need two years before they can be planted out. In this case, it is best to use a 2-litre pot from the start. Rootrainers can be used if available, but you will need to use the larger sizes for our deciduous trees. Another very important consideration when growing in containers is the compost. It should be free-draining, but retain moisture and remain ‘open’ (maintain the air pockets essential for the roots to breathe). Adding horticultural grit or coarse sand can help this. There are some very good peat-alternative composts available in most garden centres. Do not be tempted to use ordinary garden soil in containers – it is heavy and will not drain very well. Seedbeds can be used for larger-scale seed sowing. The soil should be forked over before or during the winter to a depth of 10-15cm removing all weeds and weed roots as you go. 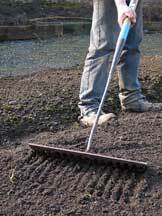 Rake over the soil in early spring to remove any debris and large stones, breaking up any clods of soil. The seedbed must be firm, so walk over it on your heels (only when the soil is reasonably dry) and rake again. Check to see if it is flat, even and neat. You are now ready to start sowing. 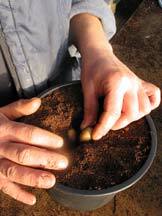 As a general rule seeds are sown to the same depth as their diameter. This means that an acorn (1-2cm diameter) is sown about 2cm deep, whereas a birch seed (1-2mm diameter) is sown barely covered by soil. This is essential to ensure good germination. Too deep and the seeds won’t have enough energy to emerge through the soil! 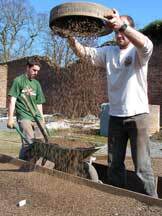 In containers we can simply Sieving grit to cover seedssow a small number of seeds per pot. These are covered with soil, firmed gently, labelled and watered. Pots should then be placed somewhere warm, but away from direct sun and kept moist. There is a slightly different approach to be taken when sowing in seedbeds. Seeds are ‘broadcast’. This means scattering the right number of seeds over an area of seedbed. It takes many years to determine exactly how many seeds to sow to obtain the best density of seedlings for best growth. If you are only sowing over a small area, aim for something like 5-20mm between each seed (depending on size – the bigger the seed, the bigger the distance). Firm with a roller or board and cover with soil or, preferably, horticultural grit to the required depth. Protect any seeds from mice and birds by using netting (oak, hazel, hawthorn and blackthorn are the most susceptible – don’t bother covering alder or birch seeds).